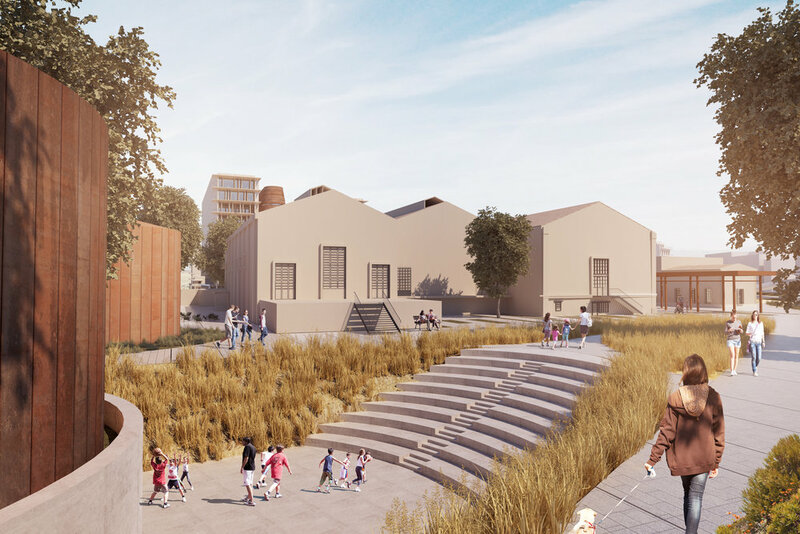 The new building complex is designed as the new image of DEI in the contemporary era, establishing a creative dialogue with the historical complex of the steam-powered station, within an urban park dedicated to sustainable forms of energy. The main building volume is elevated from the ground giving a bright entrance level based on a pilotis. The building volume is divided into three units, reflecting the threefold division of the old building complex. The units are differentiated by sliding movements on different directions. The main volume is designed based on a curved geometry, signalizing the main entrance. The proportions of the volume are delicate in order to achieve an elegant whole. The new building complex of DEI offices acts as a landmark, with its height prevailing the urban fabric. The facades of the complex are designed following a logic of “filters”, a surface which allows controlled views around the neighborhood and sun light diffusion at the same time. The architectural proposal is not limited only on the general form finding, but also reflects on the interior, referring to the final users: the employees and the visitors. The aim is to create an environment that privileges not only the productivity but also the individual’s well-being and incorporates the business ethics for transparency and collaboration. The public character of the building, combined with the historicity of the complex, leads us to consider the complex as an area of complete public access and usage: the outdoor space, the ground, is unified, and becomes a canvas of creation for the new urban park. The development on urban park with “topoi”(places) which express the character of DEI as a producer and provider of energy, create a leisure center with an educational character. The urban park, with different thematic areas, shows and reminds the alternative and renewable sources of clean energy, aiming to activate the environmental awareness. Three basic garden/places are proposed, referencing to the sun, air and water. The “sun path” is signaled by a linear canopy which can accommodate ephemeral exhibitions, markets and events. It supports photovoltaic panels that fuel the energy needs of the park. The “plaza of water” is signaled by a large shallow pond that functions as a cooling element. The urban equipment is composed by individual steel chairs which can be arranged as wished by the users, around the pond. The “air garden” is a large amphitheater that is created on the northern part of the plot, by a level lowering and uses wheat as a plantation element, visioning the sense of air. The amphitheatre can function as a meeting and game point when it’s not accommodating events and performances.